Our inspiration, a classic photo from Star Wars: A New Hope! 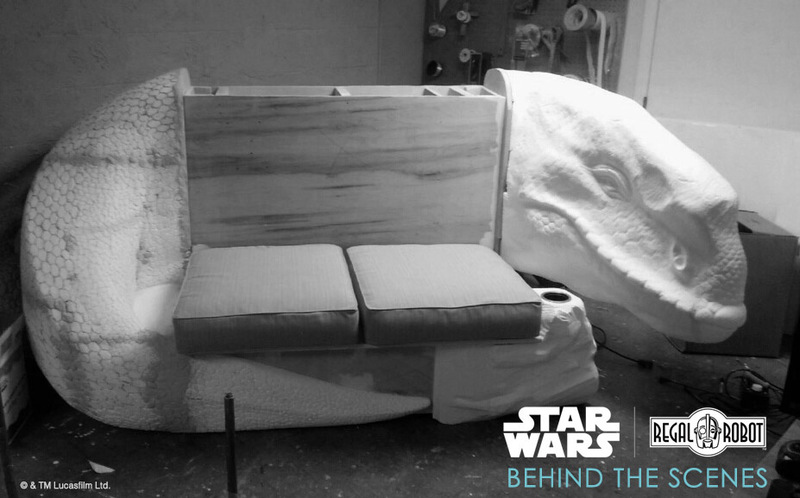 Behind the Scenes – The Dewback Loveseat, Custom Star Wars™ Furniture! Just a few of the sketches and mockups created as part of the custom studio process. And we did! We began with a number of napkin sketches, concepts and mockups, working with Lucasfilm to create an all new official product that would be a true one of a kind. The result is a furniture art creation crafted by our Regal Robot Custom Studio. We’re now offering the one-off creation for sale to Star Wars fans looking for the ultimate in official Lucasfilm approved creations for the home or fan cave. Richard Riley, himself captivated at a young age by the imagery of George Lucas’ galaxy far, far away, would be the lead artist on this project, creating this piece in the USA. Richard worked in rigid foam and wood to create a functional sculptural piece that would look right at home in any living room on Tatooine. 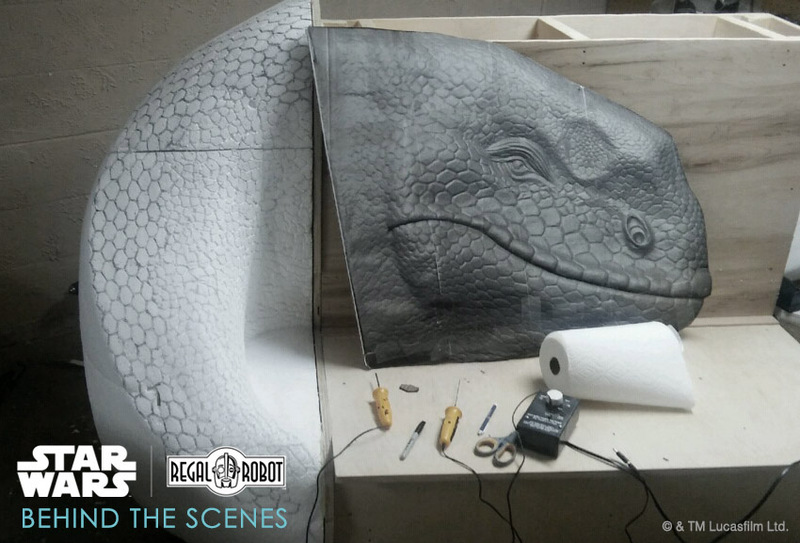 The nearly three foot long head is derived from a scan of production artifacts, originally sourced from the artist who created the beast for the film. The head was loosely milled in a rigid foam material for the general shape and scale, and then Richard hand detailed every scale and wrinkle, adding custom glass eyes to match the style used in the original film creature. The nearly completed foam and wood substructure, prior to coating and paint. The tail and desert rock elements were all hand carved in a similar rigid foam. Once the pattern was freehand drawn in place, the grooves between the scales were etched with heated tools. Ultimately, all parts would be hard coated with a resin shell for texture and extreme durability. And when we say parts, note that this 101″ long beast breaks down into 5 pieces (not including cushions) and can fit through even a 30″ wide door. 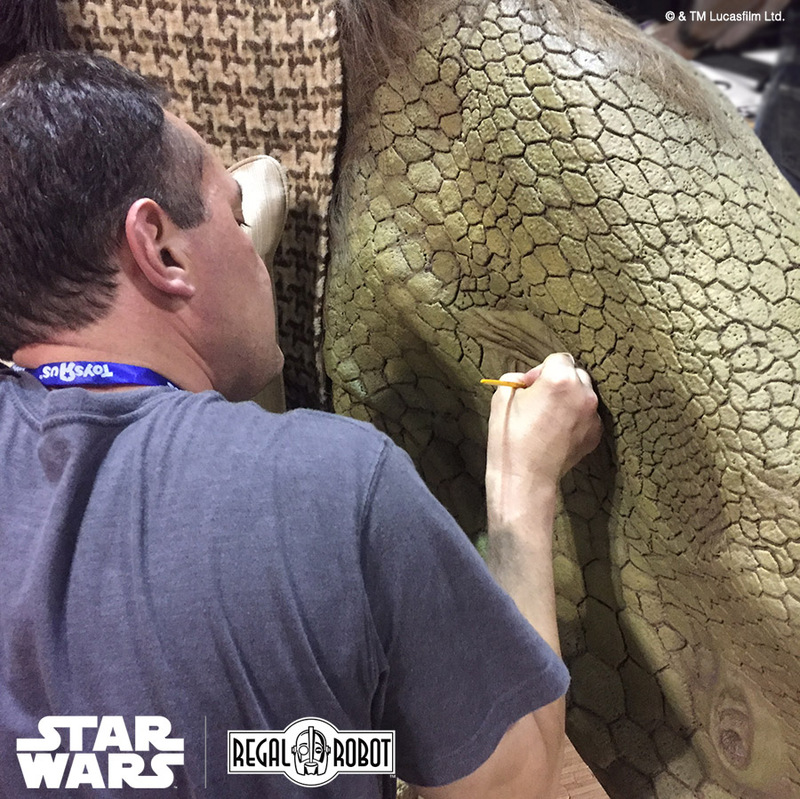 Richard Riley puts the finishing touches on the dewback’s eye area. Once coated, the pieces were all hand painted, and glass eyes installed. This incredibly unique sofa features movie-style sculpting faithful to the Imperial Dewback beast of burden from the original Star Wars in 1977. The two-seat bench style loveseat is more than just furniture… it’s a functional, sculptural art piece! The custom loveseat comes as shown with included patterned blanket, faux fur throw, pillows and cushions and even features 2 cupholders within the faux rock theming. And here’s the finished piece at Star Wars Celebration, where the crew nicknamed him, “Dewey.” This lounge lizard was the star of the show at our booth! Want to learn more, or bring this incredible, official Star Wars creation into your home, office or fan cave? 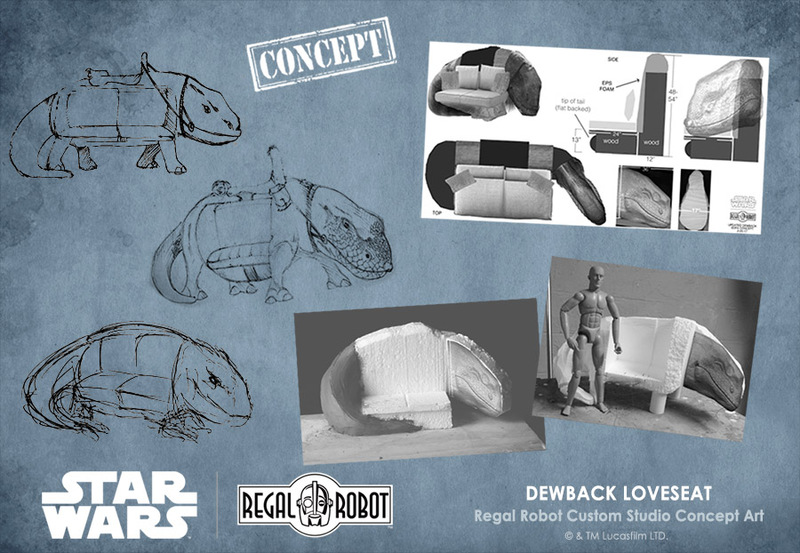 Visit the custom Dewback Loveseat item page, where you can see more photos, get further specs and dimensions or even purchase the beast! 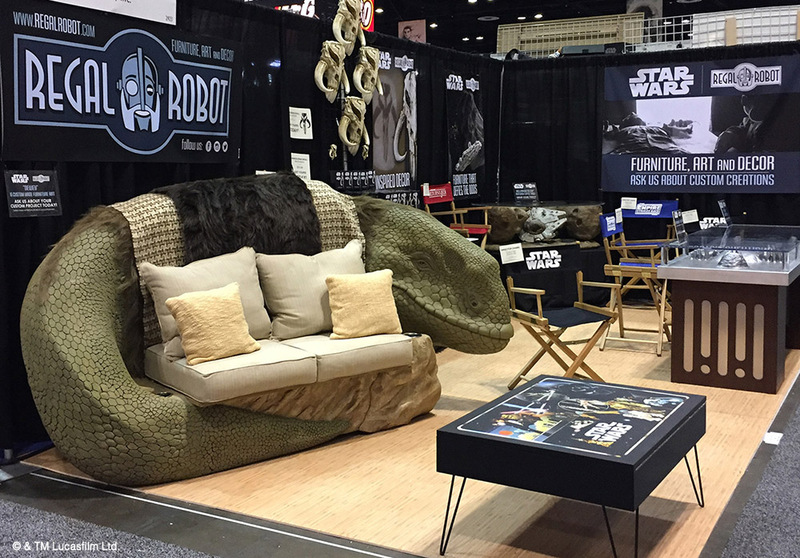 At Star Wars Celebration Orlando this year, Jordan Hembrough stopped by to talk with Tom about our Dewback Sofa for the Star Wars Show!